Chris and Tammy Megison came up with a solution: Solutions for Change. The idea is to get families with children off the streets and into a program that would change their lives forever. SAN DIEGO (KGTV) — It looks like just another small apartment. Living room. Bedroom. Kitchen. But the apartment complex 10News toured is unlike any other. It's a solution for homelessness. "People go into treatment, they get out, they relapse and the go back in and they get stuck in this thing we call the churn of in and out, and in and out of services." So Chris and Tammy Megison came up with a solution: Solutions for Change. The idea is to get families with children off the streets and into a program that would change their lives forever. "We get them jobs right away, put them to work so they can learn the soft skills of working," Chris Megison said. "They're up at 5:30. Kids are fed and off to school. And now they're going to classes, they're going to work." Solutions for change works because of its motto, driven by accountability. It's a 1000 day program. Every client must have a job, and most work in the solutions aguaponic farm. They grow their own organic food, and what they don't eat they sell, and the proceeds go back into the program. "They're not looking to be a band-aid fix, they're looking to be a 'hand up' organization. 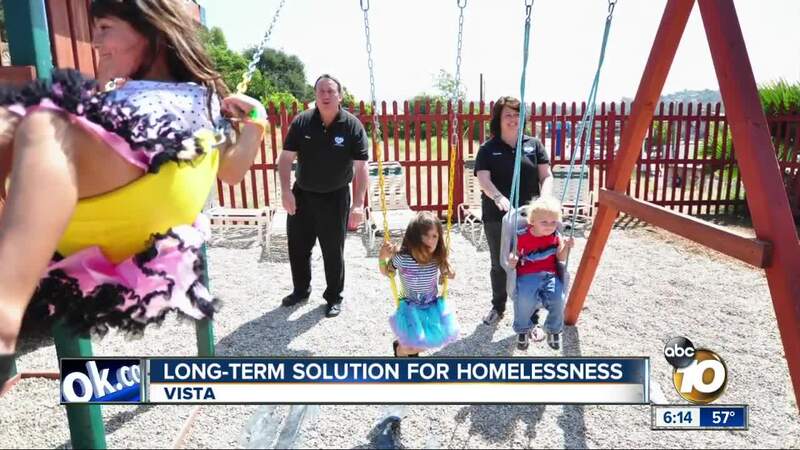 They're not lowering the bar for people who find themselves in a pretty dark tragic place, they're trying to raise the bar and set people up for future success," San Diego County Supervisor Kristin Gaspar said. And since 1999, Solutions for Change has helped 900 families escape homelessness. People like Melissa Martinez and her children who not long ago were separated without a place to call home. "It's put us all back under one roof. It's actually be a lot easier than I could have ever imagined, getting everybody to and from school, to and from work, we're really united and working as a team. So it's really just brought us tremendously closer," Martinez says. "All we ask is, 'Would you grab one bootstrap and let us grab the other and let's do this thing called life,'" Megison says. To learn how to help Solutions for Change or donate, visit their website here .